Sometimes it’s the smallest components or the ones that you take for granted that can be the most important pieces in the entire complex machine. This is especially true for generators. It may surprise you to learn that when a generator fails, it’s nearly always because of the use of faulty batteries or battery chargers. 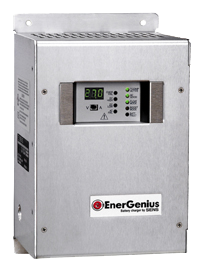 These battery chargers are integral to the overall maintenance and successful use of the generator. The batteries used in generators are either 12 volt or 24 volt to match the starting system, but the amperage can vary more widely. Depending on how large the generator set is, the batteries will range from 3 to 20 amps. As important as the batteries used are the battery chargers. We use SENS battery charger, which can detect battery problems and trigger an alarm when something has gone wrong. Proper maintenance and monitoring of the batteries and battery charger are so important because power failures can cost a company additional costs. For many businesses, downtime of just one hour could cost tens of thousands of dollars. According to the SENS whitepaper, a data center could lose $1 million thanks to a single power outage, for example. At a business like a semiconductor manufacturing facility, an outage that lasts a mere 15 minutes could cost a company $30 million. Not only that, but emergency generators are frequently used for healthcare applications where a prolonged power outage not only costs money, but could also endanger patient safety. This is why a well maintained starting system is so essential. If you don’t take the time to properly maintain and monitor your batteries and battery chargers, a generator failure could really hurt your bottom line. This entry was posted in Battery chargers, Emergency Power, Uncategorized and tagged battery chargers, battery chargers for generator sets, battery chargers for generators, battery maintenance for generators, emergency power generator sets, sens battery charger. Bookmark the permalink.